Adolescence is a time of social and developmental transition. Risk taking and reward seeking is a normal part of healthy adolescent development, but these behaviors can raise concerns when sensation-seeking leads to immediate or future harm. National data from the 2011 Youth Risk Behavior Survey (YRBS), a school-based public health survey conducted by the U.S. Centers for Disease Control and Prevention (CDC), indicate that many high school students engage in priority health-risk behaviors. Understanding the prevalence of risk behaviors, developmental assets and parental monitoring among youth is a crucial first step toward promoting behaviors and environments that are conducive to adolescent well-being. Moreover, collecting local data allows for comparison between local, state and national trends. 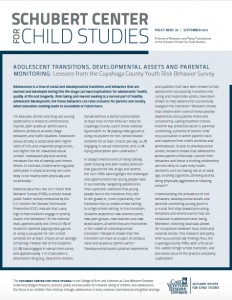 This research and policy brief summarizes key findings from the Cuyahoga County YRBS, with a focus on the middle to high school transition, and discusses some of the practice and policy implications.